Our bodies store memories in the soft tissues – organs, muscles, fascia and skin. That is why our pain is our invisible wounds GPS – it’s how we find our deepest wounds, not detectable to the eye, or the mind, often elusive to conventional medical investigation. But, we can follow your pain like a GPS through the body. At the intersection of the physical and emotional pain is the invisible wound – erased by the mind but remembered by the body. Episodes of puzzling pain, paralysis, exhaustion, insomnia, and or an overall feeling of not safe – anxiety/panic are clues it’s time to surface buried invisible wounds. The body is our map radiating signals of traumatic memories stored in regions of the head or heart, shoulders and lungs, gut and back, hips and pelvis. The fascia, a web-like sheath that connects the muscles and organs from head to toe, is a highway for your emotions and emotional experiences. The fascia below the skin’s surface is often the easiest and fastest route to the invisible wounds. It is slick keeping the body lubed but becomes gridlocked, tight and sticky in regions that contain repetitive stress, trauma or injuries. Using touch and soft-tissue mobilization, we can release the stored traumatic memories and alleviate the pain. Memories will rise from your body to your conscious mind. Some have described this as a surging feeling of fear, anger, sadness or actually seeing the memories revealed in their mind’s eye. Certain regions of your body contain certain painful memories. Your shoulders, upper back, heart and lungs hold memories of heartbreak, grief and childhood neglect. Your gut, mid-back and core harbors memories of betrayal, humiliation and searing anger when your power was seized. Your lower back, pelvis and hips store memories of sexual assault and episodes of domestic violence. Some of these traumas occurred in childhood and you no longer remember the origins of your pain. But your body keeps score of the incoming stimulus and actions that led to those threats to your survival. These memories are recorded and archived so when experienced again the body recoils and armors up. Let me break it down. If that recorded memory such as domestic violence or sexual assault is attached to scents, sounds, touch, and feelings that are experienced in your environment again and again – your body goes into a constant state of survival mode a.k.a. fight-flight-freeze. It is like a record player skipping over and over on a loop. Over time, this survival mode set in motion can become toxic, even lethal. Your heart rate may raise, blood racing away from your gut and out to the extremities to engage fight or flight. Or all the muscles and joints pull you inward to protect your vital organs – freeze. Gradually over time, whole regions of your body become unstable due to this looping survival mode. You may be unaware all of this is occurring in your body at the subconscious level. Consciously, you feel episodes of pain, insomnia, exhaustion, overwhelming feelings of not safe – panic/anxiety. These memories become survival mode programs recorded in your body that can be passed on to the next generation. So your body may have certain triggers of post-traumatic stress from body memories transmitted generationally from your parents and grandparents to you. War trauma, famine, domestic violence, sexual assault, and childhood trauma is stored in the body. Yes, you can pass these onto your children. Of course, your environment may or may not set these survival programs in motion. They could potentially stay dormant. If and/or when they are activated, your body armor will engage. But, the good news is we can disarm your body armor and survival mode. 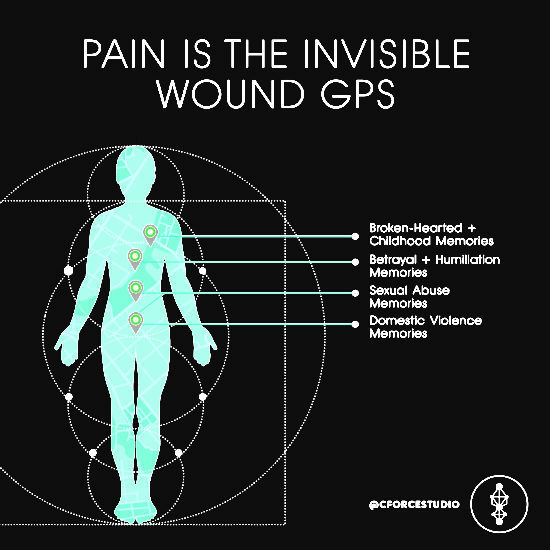 Let’s turn your pain into an invisible wounds GPS! Make an appointment with Gina, the physical and energetic therapist, and Denise, the body journalist, at Centripetal Force Studio to locate and heal your puzzling pain and disease.